Hey there, everyone! I'm not sure how many people remember me over the past year, so I thought this would be as good of an opportunity as ever to briefly reintroduce myself. I'm tagami_yami, but you can call me Tagami. I've been a member here since August of 2008, and my main collections involve Mewtwo and Darkrai, with some Scolipede on the side (due to lack of official merchandise). I have a lot of side collections as well as some "oops" collections. You can probably blame the "oops" ones on associating certain Pokemon with my original characters, haha. Under the cut are pre-made keychains I have for sale. Help me get rid of these. I was running commissions for these, but they are currently closed. My bf asked me to make several of these as Christmas gifts, so I'm out of supplies at the moment! Hey everyone, it's been a while since I've posted. Sorry about that, Xmas really took a toll on my money so I didn't have much funds for here. BUT I have been lurking. lol and buying a few things. And I just got one of those things! My NEW round head Emolga plush! I got it from donny9 . And it came so frekkin' fast in the mail! Here's a pic. of him with a Pokemon Center plush for size comparison. This is my pathetic Emolga collection. XP But I JUST started collecting them, so I hope it will grow more soon. My next goal is to buy a Japanese MWT Emolga Pokedoll. As always, sorry for the crappy photo. =[ I'm really bad at taking super clear shots, I must shake or something. O.o? I've added some items to my small Sales Post, please take a look! 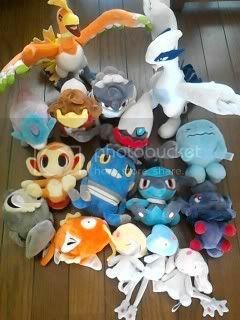 :) Includes Walky Charmander plush, Leafon pokedoll, laying plushies, etc. Edit: also checking interest in a japanese Soul Silver, complete with box+manual+pokewalker. Send an offer my way! Just wanted to share with everyone some stop motion videos my brother made with our Pokemon plush collection (mostly Pokedolls). I've noticed some people do "photo stories" with their Pokemon collection, so I hope you enjoy this stop motion. I posted the trailer a while ago; some of you may have seen the trailer before. If you enjoyed the videos, please pass them along to anyone you think might enjoy them. Ok, looks like I have a teeny amount of money to spare, so I'm going after a couple wants that I'm really behind on! Just need Sandile, Alomomola, and Muuna to complete this collection. I'm REALLY hoping that someone has all 3, because I'm wanting to get them all shipped together! Wanting to pay $4 shipped for the 3. ☂ Audinos and Reunicluses and Maractuses, oh my! Hey guys! It's been a while, but I've been about! Happy New Year, too! Last time I posted an update, back in August, I showed you the beginnings of my Audino and Reuniclus-line collections. Do you want to see how much they've grown? Good, because I have pictures! But before that, I received my 2011 Zapdos charm from Gin and I took a comparison shot with the 2009 charm! It isn't a lot different- the pose is still That Same Pose that Zapdos is almost always in, but it's different enough for me! I'm thankful it is different, at least! Do you think it's worth GA-ing? Hello hello this wonderful community! I have officially been on here for 1 month from TODAY!! I have really enjoyed my time on this place, actually too much. I've looked at my finances and realize....I NEED to slow down on the purchasing lol!! So with that I have purchased so many beautiful plushes thanks to this community! You have all been a positive force in my PokeMon loving. So thank you!! Thank you all again for being amazing. This is also a not complete collection update. I am waiting on 11 more plushies to make their way into my mail box!! If anyone has one of these and is willing to sell, I'll definitely take it off your hands. I decided im going to have a small collection of Entei plushies, and i already have the lottery prize otw from SMJ (just found out its the rarest plush of him second to the giant one which im now on the hunt for someday) anyone know where i can find the 9" poseable tomy plush? 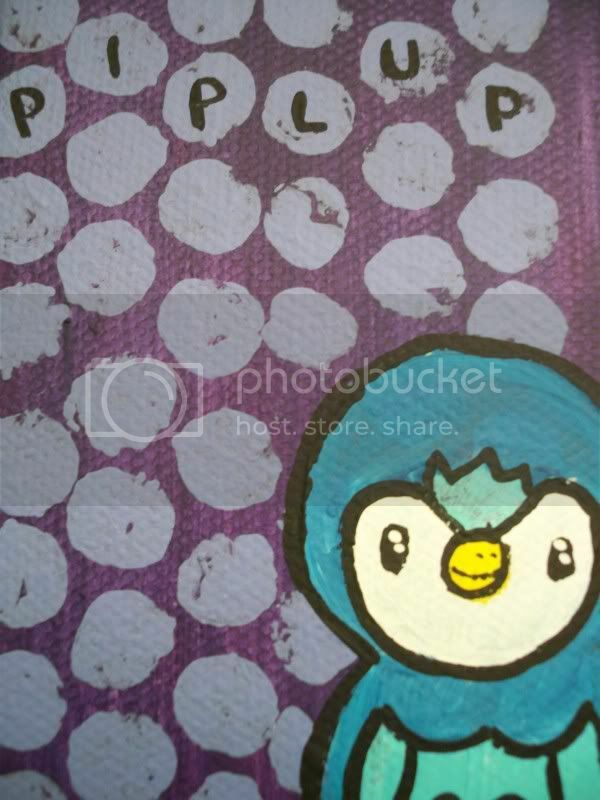 photo taken from Pokemonplushproject's flickr. Found one thanks so much guys! Collection update coming soon! Now here's a meme! Your favorite piece of merch you got in 2011! Hello loves. :) I've been a lurker for a while of course, and I was going to wait to make my intro when I had all of my collection photos completed, but I found a reason to post much sooner instead! 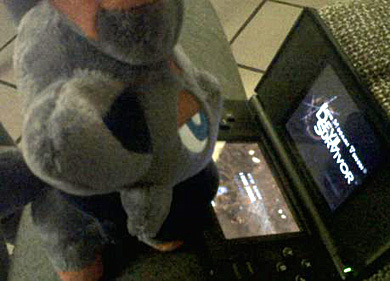 Last night, I read for the first time the Mirage Pokemon plush post. It excited me to no end and now I want to hunt down as many as possible! I decided to check eBay first, and what did I see, but what was an identical Squirtle plush as one in the Mirage post. I contacted Gin and she instructed to post it here and find out if it is really a Mirage Plush! 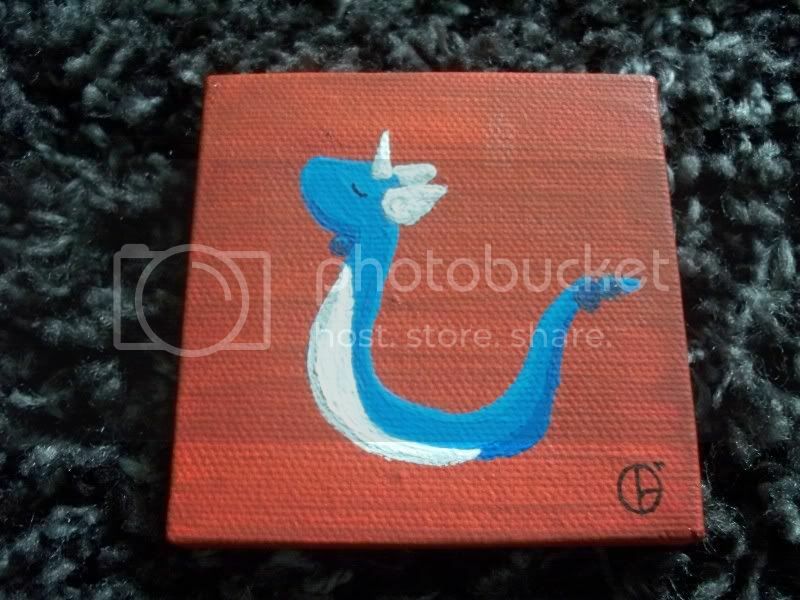 The person is selling it in the UK for less than $40... so it made me kind of sketchy. That and the fact that they claim they have 6 of them! It is so cute and I can't decide if I can justify buying it. But if it really is a Mirage Plush... I really don't know! XD Please, fellow members, help me figure out if this is truly a Mirage Squirtle! Hi! Just a new face saying hello to all of the wonderful Pokémon collectors here! I've been into pokémon since I was a little kid, as I'm sure most of you have been as well, but I really got back into collecting a bit over a year ago. I walked into a local toy shop and saw the canvas vulpix plush and I was doomed to collect pokémon plushies since that day, haha. If I had known about this wonderful community I would have join earlier but I found it now and I'm very happy to have a group who completely understands the awesomeness of collecting Pokémon. I will post some pics of my collection, once I figure out more of LJ (still learning). I joined just to be a part of this community. So hello everyone!